One of North Carolina’s Most Impressive! Many guests arrive at Hill House just itching to get settled in, put on their hiking boots, and get out into all the many outdoor adventures that our area has to offer. We know the feeling! For those seeking some quality time in nature, the mountains around Hill House are home to some of the best hikes the Southern Appalachians have to offer. Nearby Catawba Falls is one of our favorites. 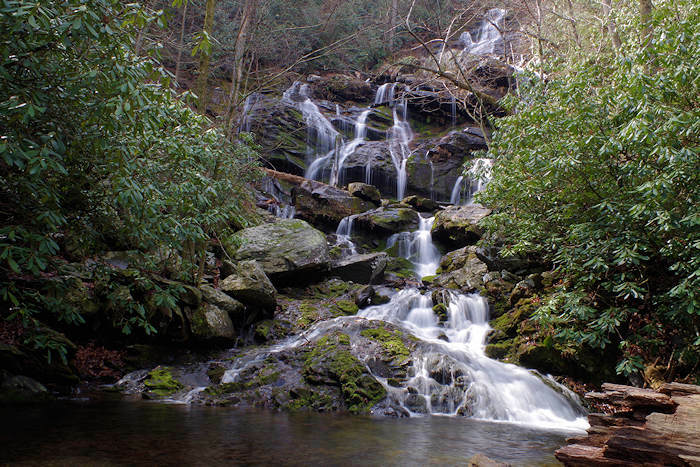 You won’t regret taking a morning excursion to walk through old forests, ford the shallow, rocky, Catawba River and then take a plunge in the pool at base of the plunging falls. 3 adventurous, but very manageable small stream crossings (however in times of heavy rain these stream crossings can make the trail dangerous and impassable). Interesting historical “ruins” of a dilapidated hydroelectric dam. Impenetrable rrhododendron thickets and a quintessential Appalachian cove forest ecosystem. And of course, the big pay off: an enormous, complex, waterfall — one of North Carolina’s finest. 8:00 AM – Wake up in a luxurious Hill House bed, get a cup of coffee and dress for hiking. 9:00 AM – Eat a filling breakfast at Hill House to give you energy for the day. 12:15 PM – Arrive at Trailhead Restaurant and Bar in downtown Black Mountain. Great, casual spot to get a lunch burger and a local beer after a hike. Hiking attire is perfectly welcome, and a little “hiker funk” is okay too! 1:15 PM – Take a short drive up above Black Mountain through the fairytale-like town and college of Montreat. 1:45 PM Head back to Hill House with a full belly. 2:00 PM – Arrive at Hill House, shower, rest, have a cookie and then enjoy your evening in downtown Asheville! (Use this address for your GPS: 3074 Catawba River Rd, Old Fort, NC 28762). As you travel down the off ramp of exit 73, take the right turn onto Catawba River Road before you reach the end of the off ramp. The road will end at a bridge. Cross the bridge and enter the parking lot. The trailhead is on the right side of the parking lot, to the right of the information kiosks, at the edge of the parking lot opposite the bridge. Make sure to bring a water bottle, tennis shoes or hiking boots you don’t mind getting wet, and weather-appropriate clothing. You’ll want to take pictures too, so don’t forget your camera or smartphone. We’d love to see your pictures of the hike, so please share them with us on our Facebook page or tag us using @HillHouseBB.